Braque Francais Dogs - The Braque Francoise is a French pointing dog breed originating from the South-West of France and the Central Pyrenees. There are two different types of Braque Francoise, the "Gascogne" is the larger sized type and the "Pyrenees" is the smaller variety. The "Pyreneese" is the most common of the two types. The Braque Francais has a nobel appearance with medium proportions and strong bone structure. It is a powerful dog without excessive heaviness. The females are finer than the males. 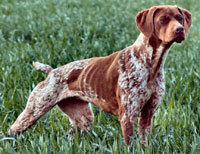 The Braque Francais is an excellent hunting and tracking dog. The breed is not common in North America and is recognized by the Canadian Kennel Club but not the American Kennel Club. 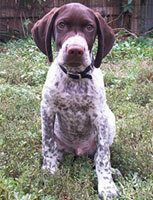 Braque Francais Breeders - Advertise your kennel puppies and dogs here.